A native of Dallas, Rita graduated from Hillcrest High School in Dallas and grew up attending Park Cities Baptist Church. She was in the junior department when Park Cities started two "mission" churches in Richardson-Spring Valley Baptist Church and Richardson Heights Baptist Church. Years later, she would join this little "mission" church of over 5,000 members now simply called "The Heights"! She has served in many capacities at her church: Personnel Committee, Library Committee, with husband Carl as Directors of Single Adults, Children's Choir teacher, Pre-school teacher, Adult Choir member, and Deacon Chairman's wife. Rita graduated from Baylor in 1969 with a B.A. degree in Elementary Education, and from Texas Women's University with a Master of Library Science degree. She taught in elementary and junior high schools for 27 years, her last several years as a Librarian in Club Hill Elementary in Garland. She is married to Carl Bonds, BU Class of 1959, and they have a son, Scott, BBA 2010, who is married to Emily whom he met in Freshman English class at Baylor. They are expecting their first son in December. Also, from Carl's previous marriage, his son Steve and wife Jacque and four grandchildren, Zane, Zach, Beattie, and Blake, who is a junior at Baylor. Rita is a Past President of the Baylor Women's Council of Dallas and has served in many capacities on the board for over 20 years. Her primary interest is the Co-Chair of Scholarships. She has a heart for students who want to go to Baylor but can't afford a private school. The Women's Council has a mission statement to support Baylor through scholarships and this has been her passion. 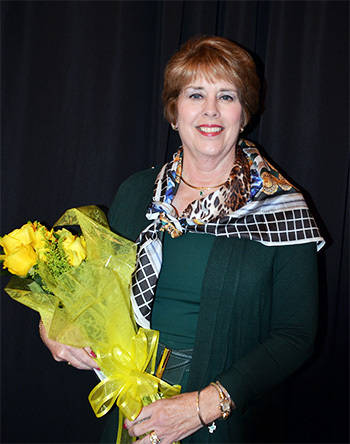 She and Carl have established an endowed scholarship at the Louise Herrington School of Nursing and she is a member of the "Going for the Gold" gala task force. She has also chaired the Richardson/Garland Baylor Parents League. They have also established an endowed scholarship for members of the Baylor Chamber of Commerce. Other endeavors include support of the Richardson PTA where she was named "Volunteer of the Year" and has been awarded a Life Membership; being a merit badge teacher and volunteer for the Boy Scouts (not surprisingly, her son Scott is an Eagle Scout); she has served on the board of her homeowners association; she is past president and current treasurer of the Richardson Doll Club; and has been named a Paul Harris Fellow by Rotary International. To recognize her service to the community, Tree Number 138 was planted in the Richardson Leadership Grove in her honor. She loves to read, travel with Carl, and watch Baylor sports, especially football and men's and women's basketball. She has adopted the motto of the Baylor Chamber of Commerce: "Anything for Baylor."